Importer & Supplier of Dampness Treatment Services & Rising Dampness Treatment. Our product range also comprises of Water Repellent Material, Waterproofing Material and Waterproofing Polymers. Our company is the prominent company in the field of manufacturing, supplying and exporting of Rising Dampness Treatment Services which has got excellent penetrating capacity are resistant to corrosion and abrasion. Uniquely formulated from Silane, these rising dampness treatments has excellent quality and are available in various specifications to meet the ever-growing industrial requirement. In addition to this, these rising dampness treatments easily react with the minerals. Damp Proof Liquid is water based low viscosity, highly penetrating Silane Siloxane damp proofing solution, which has been specifically formulated to permeate into the wet wall. Once impregnated into the course of brick work, it reacts with the minerals present to form a durable polymer damp course, which permanently stops rising damp. We offer our products with a brand name Elasto. 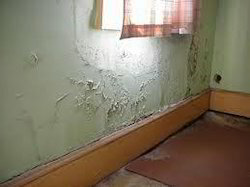 Looking for Dampness Treatment Services ?